Mega Man X is one of my favorite franchises for the past twenty years. 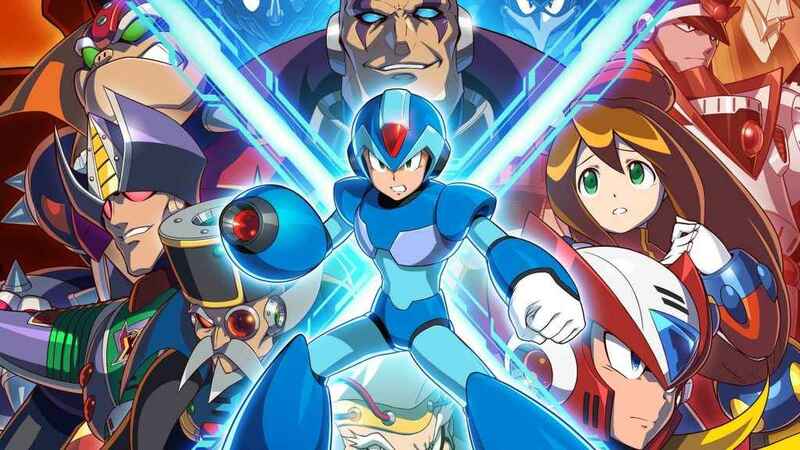 Spanning eight numbered titles a remake and a spin-off, the X franchise took Mega Man into a more mature universe all the while keeping the spirit of the Mega Man franchise alive. With Mega Man X Legacy Collection 1+2 I got to relive some of my favorite moments as well as some of my most frustrating ones. 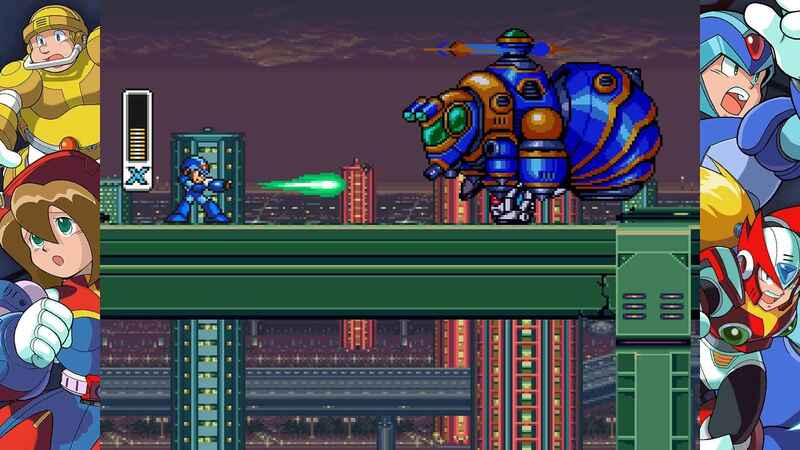 Mega Man X tells the story of X, a Maverick Hunter who (unsurprisingly) hunts down Maverick which are rogue Reploid machines that have been infected with a mysterious virus that changes their programming and forces them to attack mankind. The Maverick Hunters on the other hand, suffer a crushing betrayal when their leader Sigma, becomes a Maverick and kicks off what is called the Maverick War. 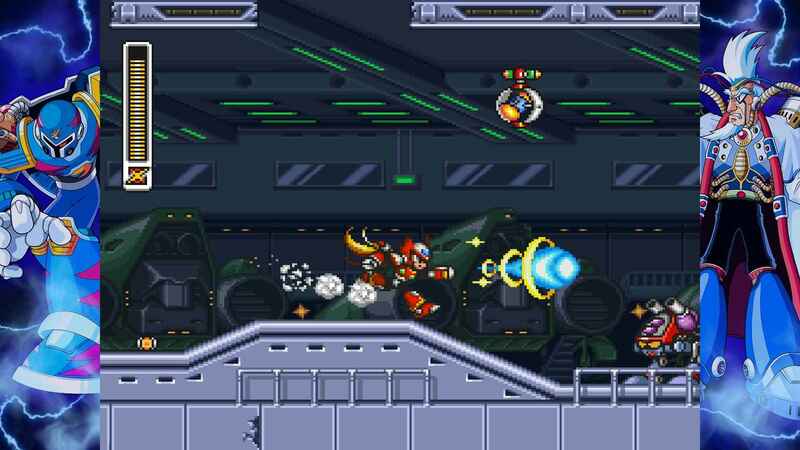 With the help of his partner Zero then, X sets off to stop Sigma in hopes of saving mankind and stopping the war. The X story spans eight titles, three console generations and is actually pretty coherent when you consider when the X franchise began and when it ended. That’s not saying that each title ends in a cliffhanger or is difficult to understand but they do reference a lot of what happens in past titles, so a knowledge of the story up until now certainly helps. The Mega Man X titles follow a similar approach to the classic Mega Man titles. After a prolonged level you’re able to select whatever mission you want to take on and whatever boss you choose to tackle. As before, defeating the boss of the stage you have chosen allows you to acquire a new weapon that contains the abilities of the defeated boss. One of the things that makes the Mega Man games fun to play to figuring out which boss to tackle first and learning which bosses are especially vulnerable against the Certainly, weapons you collect. This trial and error approach may turn some players off but it’s this experimentation that adds a lot to the X titles. Not only does it help to figure out enemy patterns but the X titles encourage repaying levels that have already been completed once you acquired new weapons. Hidden Heart Capsules, Energy Tanks, and Armour upgrades are hidden in levels and some can only be acquired with specific weapons that are acquired from other stages, lending the game a welcome sort of Metroidvania aspect in the process. I should mention that for those thinking that they have it bad with hard games these days clearly haven’t experienced the Mega Man X titles – I personally consider them some of the hardest games I’ve ever played. Certainly, the sheer anger you will experience from not just during the boss battles, but from the stages themselves has brought back some bad memories. On the other hand however, the sheer joy of completing a stage and destroying that boss that’s caused you hours of misery makes it all worthwhile. As the X games moved on from their Super Nintendo origins and moved over to the PSOne a lot of changes came with them. 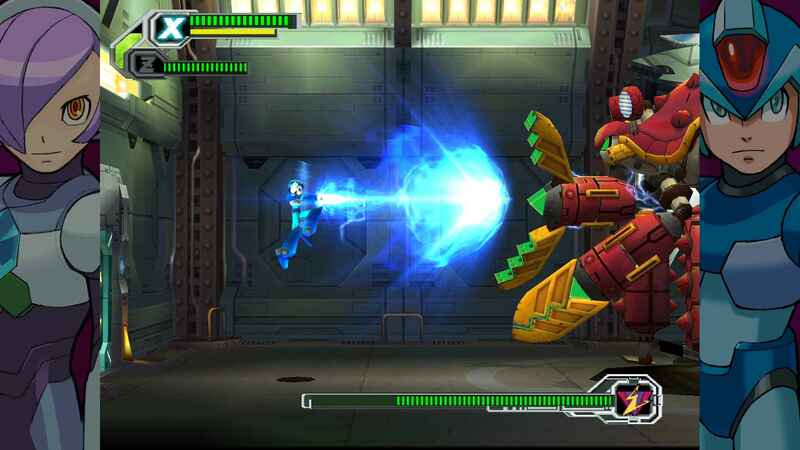 Mega Man X4 (my personal favorite) introduced Zero as a playable character and allowed me to wield his awesome beam sword for close range combat. 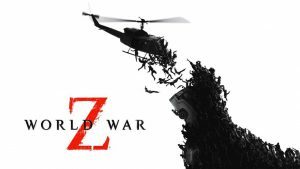 More changes began to appear as the franchise moved forward but not all of them were for the best, and indeed some of these changes led to the demise of the franchise. This is especially true as the franchise at that point was moving away from the more simple mechanics that made Mega Man so straightforward and fun to begin with. MegaMan X5 and X6 started introducing mechanics like saving innocent Reploids, switching between X and Zero on the fly, and multiple endings. They also now prevented you from shooting through walls, which was unavoidable for a lot of the encounters in past titles. Additionally, they also introduced inclines to the stages without giving you the option the shoot enemies diagonally, which as you can imagine certainly leads to a lot of frustration. 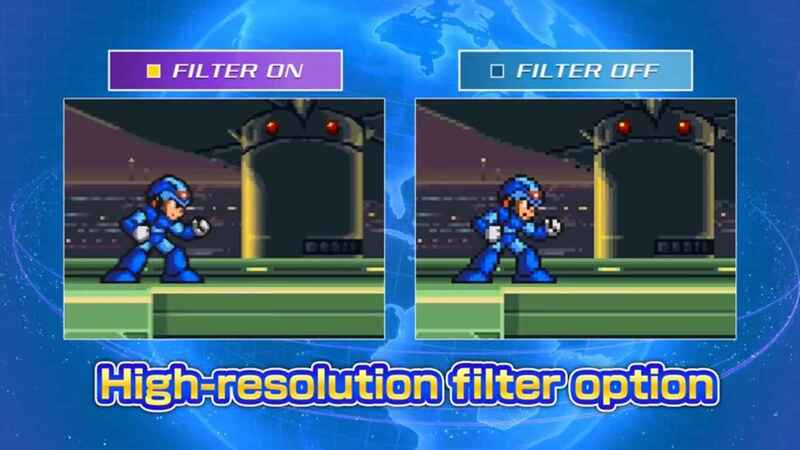 A nice filter change allows you to play the games with a smoother look but those who prefer the pixilated look can keep it as it is. One of the new features of the X Legacy Collection is that it allows you to change the graphical filter allowing for smoother textures, or, if you want change it to be as pixellated as they were when they were released. What doesn’t help is changing the screen size however, as all the titles in the collection are windowed but can be forced to be played on full screen, the end result being that the image gets unnaturally stretched and just looks odd. Though I never changed the screen size for the retro titles, when I got to X7 and X8 (which were both PS2 titles back in the day) I gave it a shot only to again have the screen stretched out and look poor once more. I was hoping that Capcom would have taken the time to make changes to these two titles much like they would for the PS2 Classics. It doesn’t hurt them in any way but seeing as they are the two weakest X titles, I was disappointed no extra effort went into improving them. Thankfully, load times are virtually non existent in most of the titles in the ciollection and although they all have a modern save system implemented, you’re still able to go old-school and use the old password system if you want. Ultimately, having such a feature just helps to keep the purity of the titles alive and I love it for that. I should also mention the animated scenes that came into the franchise with X4 also didn’t get much love when it comes to quality or up-scaling, but then again I love the fact that they kept it pure just like it was when it released, if only because it started pressing my nostalgia triggers. As a bonus, this collection even includes the awesome “The Day of Sigma”, an animated short movie which everyone should check out before they start playing just to get a better understanding of the Mega Man X story. There are even more awesome freebies included in the collection, too. Full soundtracks are available to listen from each game, hundreds of concept and promotional art can be viewed and even historical facts on the merchandise based on the franchise can be read about too. In fact, when I was reading through the history of some of these objects, such as comics, statues, model kits, and everything else in between, it was a real joy and I just lost myself in a lot of it for minutes at a time. In the end, the Mega Man X Legacy Collection is a fantastic way to relive some of these great titles. 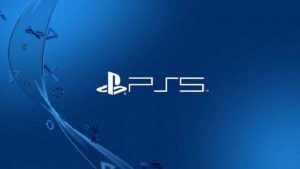 Although not every X game lives up to its potential, or has been given given the extra attention it needs, there is easily enough great content here to outweigh the bad. With eight classic titles and a plethora of extra content this collection is simplay a must buy for every Mega Man fan. Mega Man X Legacy Collection is available now from Capcom on PS4, Xbox One, and Nintendo Switch.